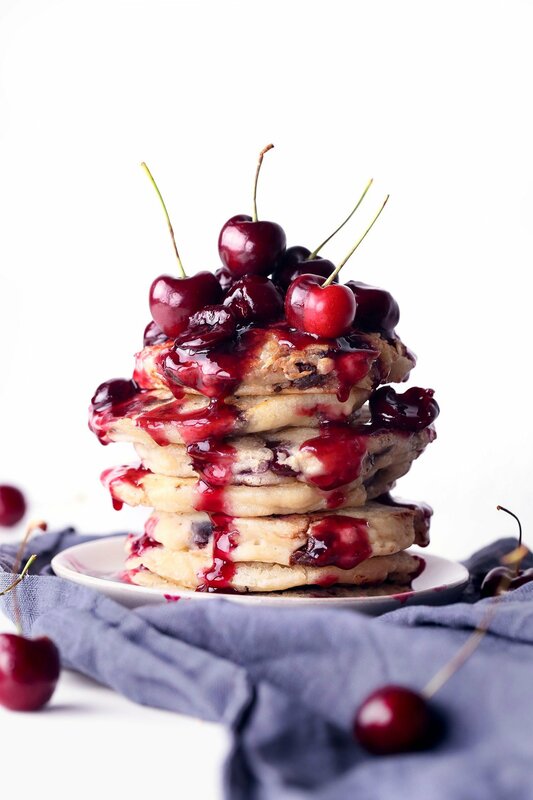 These vegan friendly pancakes are full of juicy cherries and pockets of melty chocolate. They're made even more delicious with a simple maple sweetened cherry sauce! Refined sugar free with gluten-free option. In a glass measuring cup or small bowl, combine milk and vinegar. Let sour while you combine other ingredients. In a mixing bowl, combine flour, baking powder, and salt. Stir in oil, maple syrup, vanilla, and sour milk, stirring just until combined. Fold in chocolate chips and cherries. Don't over-stir as this creates tough pancakes. Lightly grease a non-stick pan or griddle and place over medium heat. When hot, add pancake batter by the ¼ cupfuls, flipping after a minute or so, when edges are set and a few bubbles appear at the surface. Makes 6–8 pancakes, depending on how big you make them. Serve with cherry sauce. In a bowl, stir together water and cornstarch to make a slurry. Set aside. Place pitted cherries in a small saucepan and mix in maple syrup and water/starch slurry. Set the saucepan over medium-high heat and gently mash cherries to release juices. Continue to cook until sauce begins to thicken, about 3–5 minutes. Stir continuously to keep sauce from burning. Add a little more water if sauce gets too thick. Serve warm with pancakes. Refrigerate leftovers. *Depending on the flour you use, a little more milk may be needed to get the right consistency. Gluten-free flour tends to need a little more liquid. Add an additional 1–3 tablespoons of milk, if needed, to thin the batter. You want it to be thick, yet pourable!